As I sat there each morning gathering my thoughts, I would ask myself why would God want to meet with me early and then I would ask Him, “Jesus, you know me when I first wake up.” But, each morning we sat down together. My Bible laid before me, my coffee cup steaming, and my notebook to write. In our scripture focus for the day, we are reminded that beginning and ending our day with thanksgiving and praise is considered an act of faithful obedience for those who serve God. Why start our day with God? This mid-morning girl has asked herself this question often. Because, when I start my day out with Facebook and the Today Show, I can get gloomy quickly. My spirit becomes anxious. I feel disconnected when I study. My days were starting with a hefty dose of bad news. Just as a good Father does, God used Holy Spirit to convict me over checking in with social media and TV before checking in with Him. Just like starting our day with God improves our day, ending with expressing thankfulness improves our night and our sleep. I encourage you to think of two or three things you can say, “Thank you, Lord for...” each evening before you close your eyes. I still get pulled to my phone first thing each morning. I still want to “get awake” before I have my quiet time. It’s a battle for me, but the rewards are great – peace follows obedience. How about you? 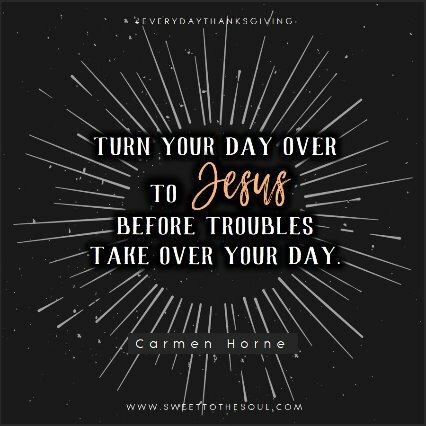 Will you join me in turning our days over to Jesus before they become bombarded with troubles of the day? Lord, help us to remember that a victorious day begins by meeting with You in the morning and that sound sleep happens when we end our day with thankfulness on our lips. We need the peace and wisdom only You offer. Thank you that Your mercies are new every morning, Lord. Great is Your faithfulness. In the name of Jesus, amen. References: Walsh, Shelia. 2015. 5 Minutes With Jesus. Thomas Nelson. 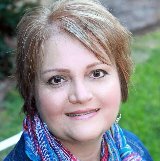 ​Wife, mom and Jesus girl best describes Carmen Horne. She has been married to her fella, Lary, for 38 years and has one beautiful daughter. This is encouraged for me, Carman and Jana. Just recently I was convicted to not even look at social media while my coffee makes. I try to just sit there and wake up with Jesus before my quiet time. Not always easy, but it's my best yes.